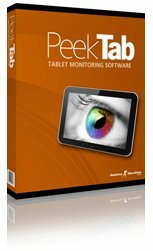 Recently Retina-X Studios, LLC, has announced the release of the PeekTab, which is the world’s first multi-platform monitoring software for tablets. This will allow the parents and employers to monitor tablets in complete stealth. This monitoring system has been released for both iPads as well as Android devices. This software runs silently in the background of the tab and also shows no visible access to the user of the tablet however the tablets activity is recorded and sent to a secure online control panel via internet. This control panel then organizes and displays the information to the parent or the employers from any web browser, enabling remote monitoring of the tablet. According to Retina-X Studios CEO James Johns, the tablets are also an internet device which has a potential for internet abuse like the Smartphone or the computers. With the help of this software the customers will be able to see web history, GPS location, photos, text messages, emails and apps installed. Many companies who provide tablets to their employees can now monitor their employees along with the parent who wants to monitor their kids by checking on them. The GPS feature also gives the family to keep their children safe by knowing their exact location. Although they already have released the versions for both iPad and Android devices they are also working on Blackberry PlayBook and will also be released soon. The software or the service comes with a toll free phone and online support along with a price starting at $29.97 per quarter. The software is currently made available for download at www.peektab.com.